Rokslide is built on gear discussions and reviews. So many of us enjoy working through our gear each offseason to find areas we can upgrade. Like Chas mentions in this article, some of the most common threads we see on Rokslide are "critique my gear list" or "what (insert gear item) would be best for my use?". Whether you're a seasoned vet or a first-timer, I think you will find Chas' story of building his kit quite useful. That was a great article. I hope that all the guys that are like us that come into this forum get to read this. I have put myself in some great gear over the past couple of years by taking it one piece at a time. I keep a screenshot of what I am working for on my phone and I start scraping and saving where I can. Thank you! Yep - one piece at a time, just like the old Johnny Cash song... A big thing for me in just getting together the equipment which will get the job done, albeit mid-tier for most things - is it shows me what exactly I want in terms of form/function when it comes to dropping the big dime on premium gear. If we had not chosen this new hunting area I would probably never had really examined my gear - it all worked well for what I was doing. It's just so easy to become complacent and avoid investing in newer/better when the old stuff just keeps working. Sometimes we honestly just don't know how much we don't know. Prior to a year ago when somebody mentioned wool I had visions of the 3 lb. 1960's Pendletons hanging in the closet - Merino was something I just wasn't familiar with. I loved my Eberle Mainframe with batwings and that drove my later choice for a Nomad 2. My Midori tent will absolutely work for what I need this year, but an old fat guy needs a bit more headroom crawling in and out so a teepee/tarp will be a premium choice to acquire next year. I don't consider it "wasted money" if a mid-tier item at 1/4th to 1/10th the cost helps me choose better gear that fits my needs perfectly down the road. That was a great post indeed . I look forward to reading it when I get some time. If the article is half as good as the title, it will be well worth the time. Not sure what you do for a living, but I bet you could make a fortune writing clickbait ads. Nice article. While my wife rarely ever hassles me on spending money on gear, I still try to be practical and weigh out benefits of the purchase against the gear I already have. The gear that I already have typically wins out. "Buy once cry once" sounds great but Id venture a guess that few of the folks quoting the phrase are actually doing that. Instead, they are gear junkies that buy over and over as well. Whatever turns your crank, but some of us have to be a little mpre practical by not only necessity but by our nature as well. but some of us have to be a little more practical by not only necessity but by our nature as well. Like you, if my gear works I stay relatively standardized with what I have. No lack of bloodstains on any of my old gear over the years. It took me months to finally sell my LoDrag pack - that thing has seen hundreds of miles on my back over 6 years and was bulletproof for what I was doing (I hope shotgunchief on here sends me a postcard now and then of it's new pursuits - LOL). After the new set-up, I have no regrets about selling - but would I ever make that investment without a defined need driven by the new hunting area? No way! This is a great article! I’m in the same boat, and have slowly been building my kit over the last year. My personal favorite “budget” scores have been an InReach with a busted screen (which doesn’t matter because it’s paired to my phone) for $25, and a Steripen for $35. Both off of EBay. Also, I just picked up two Klymit StaticV Lite Insulated for $40/each. Klymit has some GREAT deals on their eBay store on factory refurbished stuff. My wife is also good about letting me buy gear, but I feel I owe it to my family to be as frugal as possible. The reality is, I may make 1 backpack hunt/year, so spending thousands on gear just doesn’t make sense. I work hard for my money, and I there’s nothing wrong with trying to make it go as far as possible. Great article and it puts things in perspective for me. I’m a recovering gear junky with a second kid on the way. I have outfitted myself before children were in the picture but now the reality of being frugal is here. Need to sell unused pieces of gear to buy upgrades. Promised my wife no more money going out the door and my family deserves that. Best of luck on your hunt this year and enjoy your new upgrades. It all comes together Qfrog. Before long the kiddos will be your best buddies afield. My 12 year old daughter goes with me everywhere and is almost to the age where she can hunt big game and then mom will be OK with her skipping a few days of school to come on the bigger hunts with me. Shoes are the biggest pain with the kids. Cheap shoes cause foot issues, expensive shoes they outgrow in 3 months. Build up your kids a good set of gear and embrace these years with them. The more time now getting their boots muddy, the more time they seem to want to spend later. I was a competitive smallbore target shooter in my youth. The spotting scope is a early 1970's Bausch and Lomb 20x spotting scope. I hunt the prairie a lot so reasonably good glass is important to my deer and antelope ventures out there. The scope is very clear glass and I am very accustomed to it. I took a cedar post from the farm store in Utah and fashioned a stock from the post (cedar chosen for strength, durability, weight) and then using a combination of large hose clamps and bedding compound mounted the scope to it with the raised comb of perfect height for me to throw up and be perfectly aligned with eye relief and height. I usually have shooting sticks when rifle hunting so when glassing I just lay the stocked scope on those and have a rock solid base to glass from. I stole the idea from local game wardens who I saw do the same thing from their trucks where they mounted optics to an old rifle stock. I just added some redneckery to the system and custom made a set-up for my purposes. Edit to add: more than one game warden has been very disappointed to find out the "rifle" they saw me hunting with when archery/ML hunting was actually a spotting scope mounted on an old cedar post. But hey - after forcing them into stalking me and doing their investigation I did get a couple of side jobs making them a cedar post special also! That was a fun read. Doing my first western hunt next year in Montana for elk. Putting together my first gear list, refining it, and actually starting to purchase items has been easier with sites like rokslide and these articles! actually starting to purchase items has been easier with sites like rokslide and these articles! Like I stated in the article, I never looked at the forums until my hunting partner and I decided to change units and hunting methods last year. The knowledge within this community is invaluable and the depth incredible. It was valuable in my process test driving some affordable mid-tier options before I went high-tier on a few things. I am particular in what I use and never got rid of the dinosaur items in my pack when trailer camping because they just worked and the 5# difference on a day hunt was not important to me. When counting ounces for a backpack hunt it changed my viewpoint and you can get 80% of the way there without breaking the bank. Don't be afraid to experiment and the biggest thing for me was taking the gear out, starting in the backyard, then on some ATV campouts, and finally some pack-in scouting campouts and seeing how the gear performed in the field for what I was doing. It's a lot easier to make the high dollar decisions when you know what the form and function of what you want looks like in the real world. Have fun in Montana in 2019! Fantastic. I have stopped reading posts asking for "Best ____" At this point in my life it has to be functional, not best. I only get to backpack hunt once every other year and I can't look my kids in the eye and tell them they can't get that new computer, trip to wherever, etc because I need a new backpack to maybe use 3 times over the next 6 years. Not to mention my son is going this year as well, so that's twice the gear. I carry an extra few pounds. Funny how life changes with kids and family! A whole lot can be done on $50 or less a paycheck to Amazon and building over a season or two instead of a “forklift changeout” of gear. I saw an old article of Aron’s about bushcraft last week in the Rokslide archives. 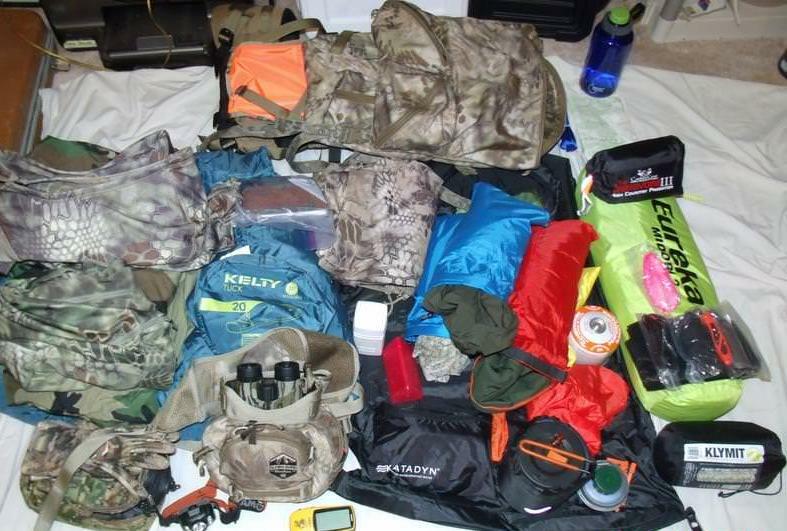 A dedication to learning the ways of the woods and basic “mountain skills” can make any trip with any base gear much safer and enjoyable and that is overlooked in the “gear race” when that should be paramount, in my opinion. Big props to the staff expertise on these forums though, not to be overlooked or diminished. Once you sort out the substance from the volume, some wise guidance on affordable option,s that are serviceable in application, can be found and the various quality reviews of the wide array of equipment really helps to determine that which is an investment worth scrimping for. Great article. It’s nice to see others are having to do it one piece at a time as well. One piece at a time. Get what is necessary to do your hunt safely, then work to do it efficiently. This year I am using my 2000 era Parker Force-Multiplier because I spent all my allowance on other gear. Next year improved shelter, bag, and bow are on the list. Why spend the $1,000 on a bow now when I needed other things in order to be safe and capable for the hunt in three weeks? Hard to hunt from my lounger holding a new bow when other gear was required. It has killed many animals in the 10 seasons it has been used (took a vacation when I was down for a bit) and, like me, is old and slow and reliable. This was the year to be capable for the journey. Next year we will refine and get the pack weight down, more weight off me, and up the weaponry. Just a real brief update here. I got back yesterday from a 7 day backpack trip chasing elk. Total weight of the pack ended up at 54#. Trail in was steep uphill and rocky. Took a while (embarrassed to admit how long it took to go 4 miles) but made it. No injuries. Ready to hunt the next morning no issues. I've identified where at least 14# can be shaved with an investment of $1,000. That's less than $100 a month between now and next season - very doable even for a family guy on a budget. Lost 5# of weight on the trip. The investment to lose another 14# off the fat old guy is just more hard work and less pizza. Steep downhill is much better with trekking poles. This was my first time using them and they saved me twice from eating dirt on the rocky trail down. DIY meals worked OK. Will invest a bit more research into food next year for better diversity and options. The Katydyn proved invaluable for my partner and I. For me, the Nomad with OGL has proven to be the perfect choice. I had the pack on hours each day in hunt mode and loved it. Sure, looked a bit Beverly Hillbillies on the way in but it handled the load way better than I did and worked like a champ. Heading back up next week, and will be at least 5# lighter just from eliminating some excess gear from the pack after a thorough debrief of what was used and needed this trip. 50 is a bit late in the game to enter the backpacking game, but no too late. Enjoyed it immensely and not seeing an army of folks in the area was a blessing. Oh, and spike elk really screw up a hunt when they come bolting in to your call through the dark timber and at 5 yards turn inside out and blow the herd up on their way out. After 8 years of not archery hunting due to some health issues, it was a blessing to be reminded of why I love archery hunting, especially elk, so much! !